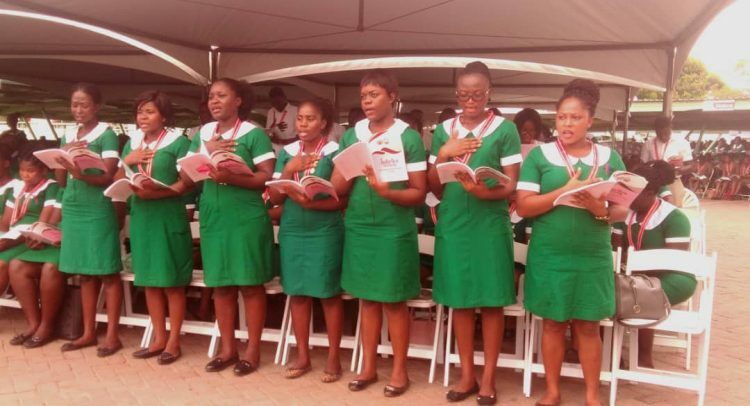 About 5,000 nurses, nurse assistants and midwives who qualified in 2017 have been inducted by the Nursing & Midwifery Council (NMC) at a ceremony in Accra. The inductees form part of the Southern Zone A cluster of schools comprising health training facilities in the Volta, Eastern and Greater Accra Regions. Speaking at the ceremony, Health Minister Kwaku Agyeman-Manu indicated that Ghana’s health system which is at a turning point has undergone major transformation over the past few years. He called for the need for the right number of healthcare workers to be adequately trained in order to overcome the daunting challenges in Ghana’s health system. According to him, the Population Council of Ghana in their statistic indicated that Ghana’s population increases day by day, coupled with the rise in multiple chronic conditions. “This means that improving the health system in the country does not only require having more nurses and midwifery professionals who are better prepared to care for the increasing population with chronic conditions in all settings,” he mentioned. Mr. Agyeman-Manu, however, indicated that the Ministry of Health, in collaboration with NMC, the Ghana Health Service and other health partners, would make strenuous efforts to provide Ghana with well-trained nurses and midwives to offer prompt and efficient healthcare services. The minister commended the inductees on their achievements and urged them to be guided by the oath of the profession. “To our inductees, now that you have made a public commitment to the professional responsibilities you are assuming in the presence of everyone here, let the oath provide guidance in the increasingly difficult, ethical, life and death decisions you will make throughout your professional lives,” he advised. “You need to be cautiously innovative and continually search for knowledge in order not to remain stale in the profession. You must, therefore, pull down walls and build bridges in the performance of your duties,” he added. In all, about 22,000 nurses, nurse assistants and midwives will be inducted this year from cluster of schools in Sothern Zone B comprising cluster of schools in the Central and Western Regions, the Middle Belt comprising Ashanti Region and Brong-Ahafo Regions, as well as Northern Zone comprising cluster of schools in the Upper East, Upper West and the Northern Regions will be inducted in the coming weeks.